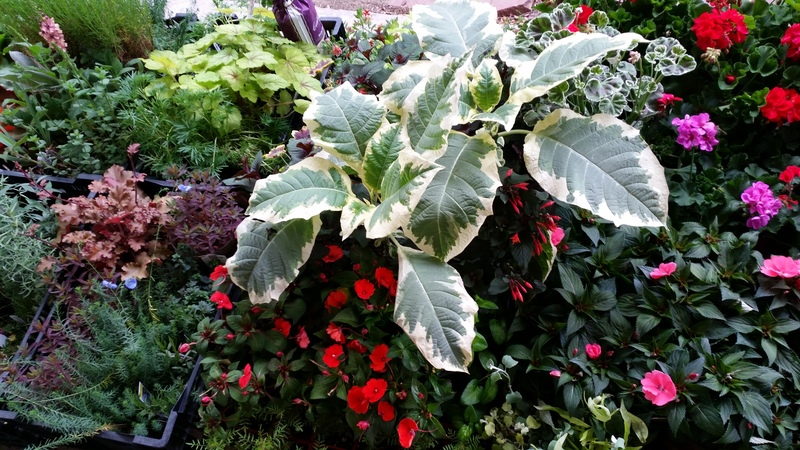 There are always lots of reasons to look forward to a new gardening season: shaking off the winter blahs; getting back into shape; seeing what’s new and exciting in the garden centers; the chance to try new ideas. Top of the list, however, is beauty. This year’s crew will bring amazing beauty to the gardens. We’re not talking simple ornamentation, here, but substance, passion, intelligence, and skill. Most of our clients met Leah last year. Her quiet confidence and cheer are incredible to be around. What you may not know is that Leah is a certified community herbalist, teaches community herb classes, and has an Associates degree from PPCC. On March 17, she’ll be teaching a class for the Vegan Society on an immune boosting herbal tonic called Fire Vinegar. When Leah isn’t working, she’s mountain biking, rockhounding, backpacking, sewing, wildcrafting herbs, checking out the local arts scene, or enjoying quiet sunshine moments in nature. Now, say Hello to Jacqui! New to Green Way, but not new to professional gardening, Jacqui brings with her a love for pruning and a great eye for container planting. With her in this sweet photo is her brilliant daughter, Della. They are together in their rooftop garden near downtown Colorado Springs. Jacqui has studied holistic nutrition, and is passionate about spreading the word about the goodness of vegetables. She’s also an avid hiker and outdoorswoman. And I’ve yet to meet Jacqui when she doesn’t have a writing notebook in hand. So much beauty to look forward to in 2018. Now, let’s just have some beautiful snow! It’s been an astonishing spring. Arriving weeks ahead of time, it has lingered, allowing normal time to catch up with it. We were way ahead of schedule by the third week in April. Now, due to cold, rain, hail, and the threat of continued unstable weather, we delayed planting annuals by a week. Nevertheless, the collecting (and protecting) has begun. Destined for front door pots. A versatile pallet from which to begin composing. 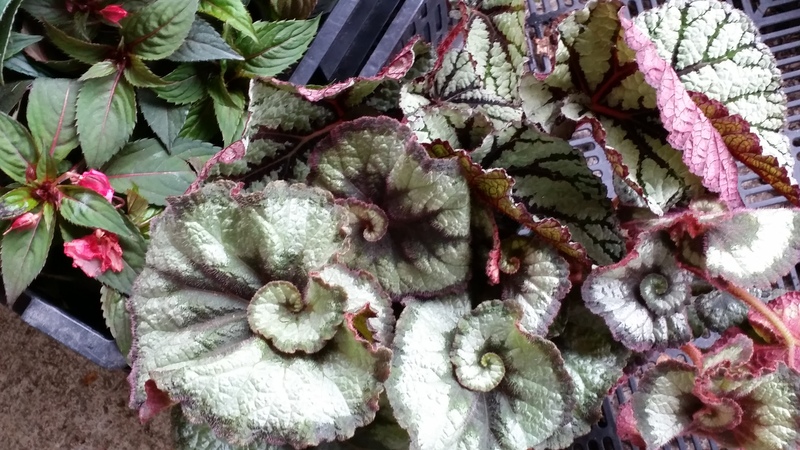 Who could resist a begonia called escargot? Now, sky gods willing, let the art begin! 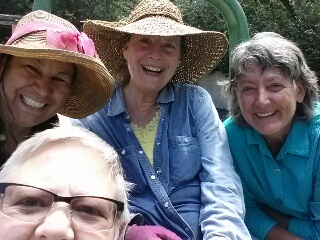 Clockwise from lower left: Julia, Diane, Rose, and yours truly. Can you tell we enjoy working together? Oh, it would be nice if this were a post about flowers that bloom twice in a season! 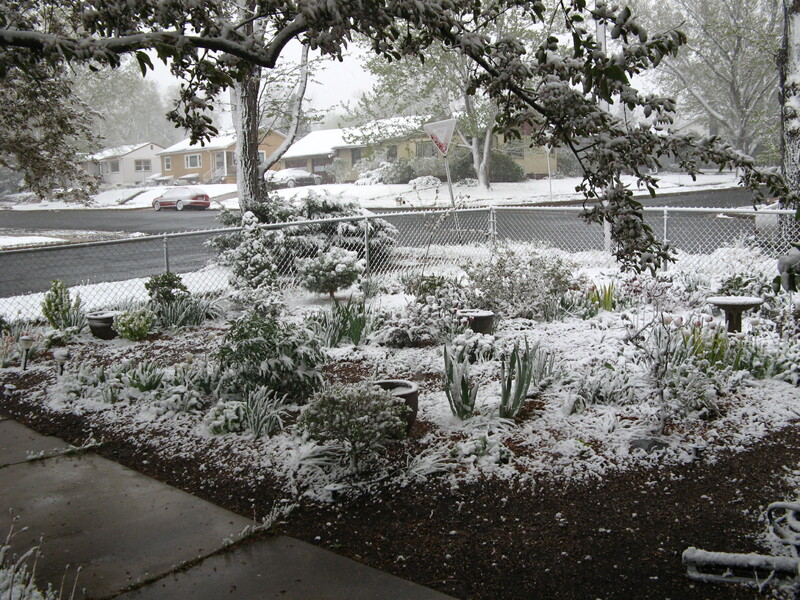 Here is my front garden on Tuesday morning, May 6. And here it is on Sunday, May 11. Last year we had a similar snow on May Day. This year, Mother’s Day. Does that mean next year, Memorial Day? Fortunately, there appears to be no long-term damage. 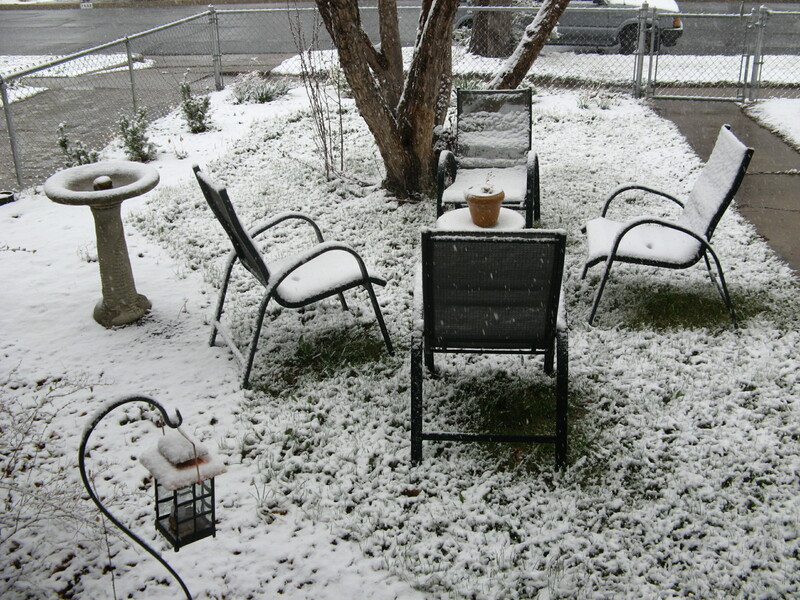 However, this late storm serves as a reminder that average last frost dates (now officially May 10 in Colorado Springs) are not guaranteed last frost dates. A few clients chomp at the bit to get annual color and plants fresh from the greenhouse at the first opportunity to wear short sleeves. Wise is the gardener who waits. 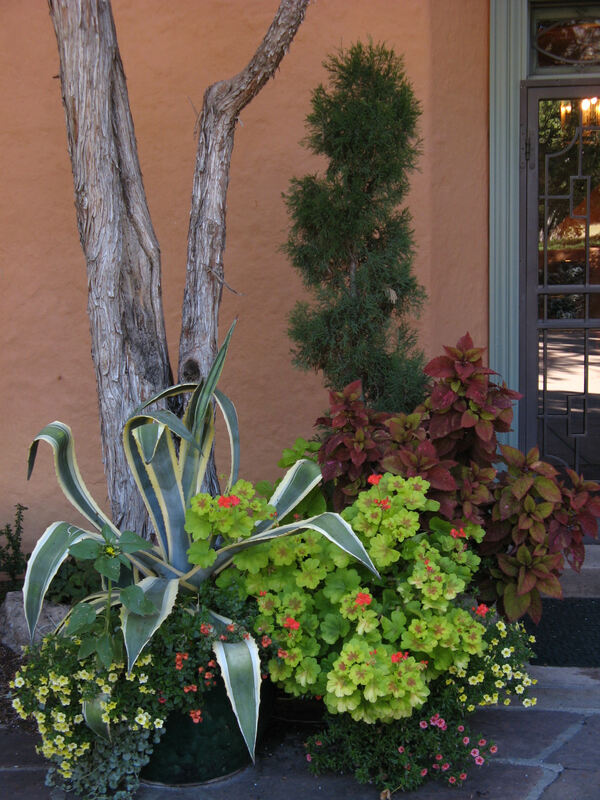 Three large pots in this grouping containing a spiraled juniper, coleus, geranium, agave, calibrachoa, and silver falls. Oh, and a squirrel added a sunflower or two, which we didn’t have the heart to pull. 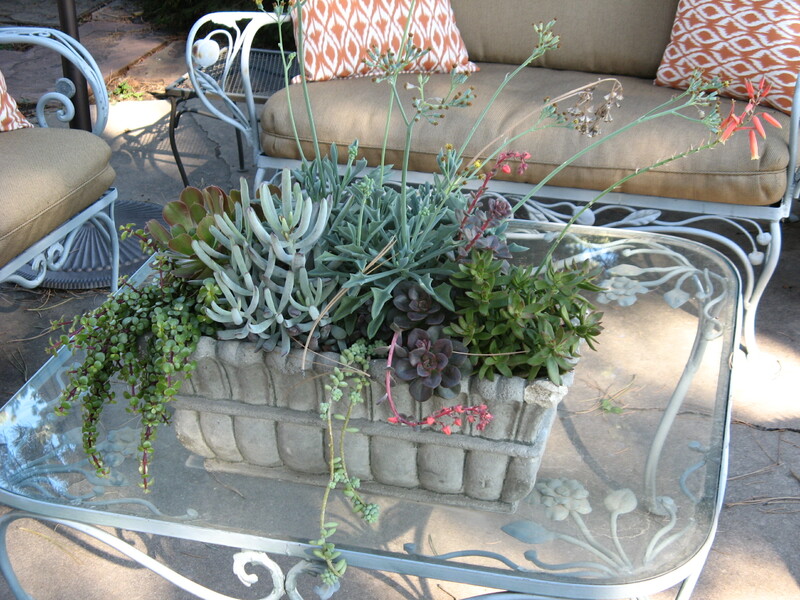 A collection of tender succulents in a faux stone planter on a poolside patio. 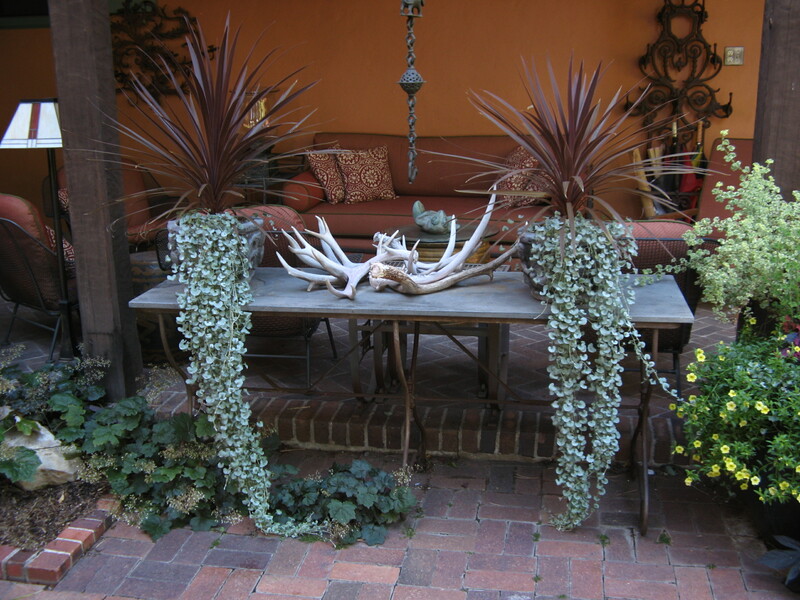 Sentry to a courtyard: variegated agave, callibrachoa, diascia, silver falls, and portulaca. 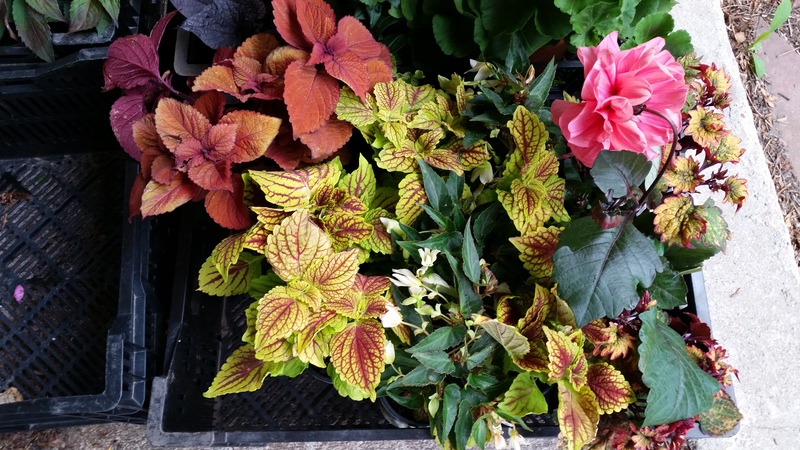 Coleus, several fancy-leaved geranium, sweet potato vine, and callibrachoa. Truth be told: These were actually the best of the pots that I caught with my camera. It was October and the first frost just over the horizon when I realized I hadn’t taken any photos. Not one. It was high time I mended my ways. Fortunately, at that moment of resolution, I was tending some very likely candidates for the “Best of 2013.” Unfortunately, it was late morning and the light less than ideal. 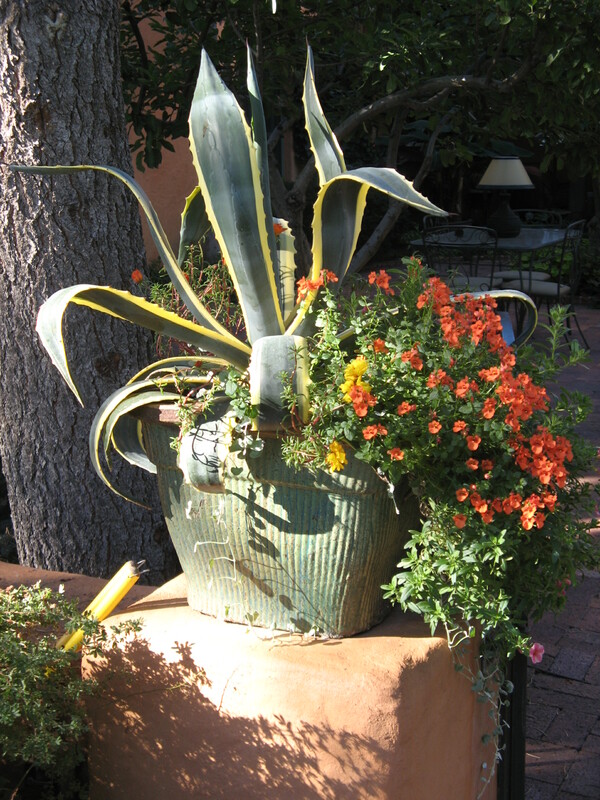 My devoted helpers and I plant and tend well over 200 pots each year. And this year we had parties and a wedding breakfast to prepare for. No wonder I didn’t think to shoot. 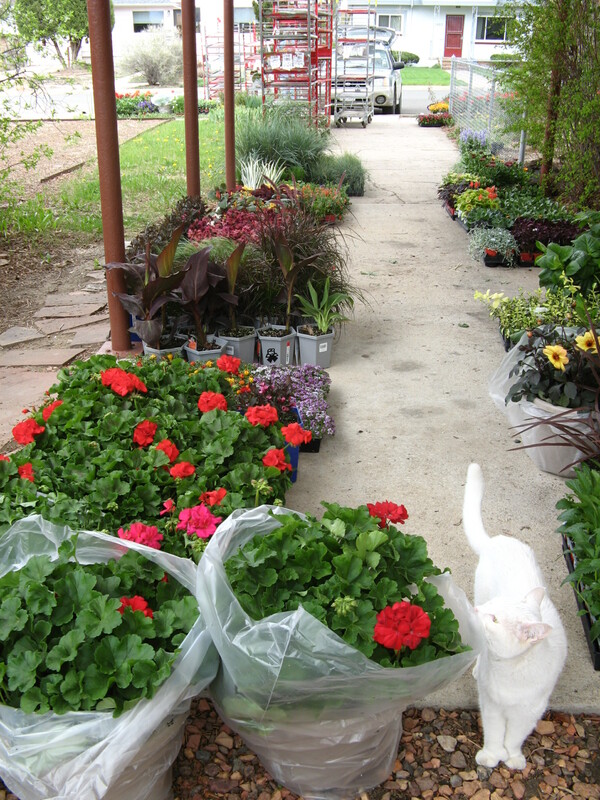 Ed inspects the first delivery of annuals in mid May. We were wise to wait until after Mother’s Day to start planting annuals. Nights have remained cool. The soil was downright chilly. Soil temperatures regulate much of the activity above ground, and when they started to warm, our fair city greened in a hurry. 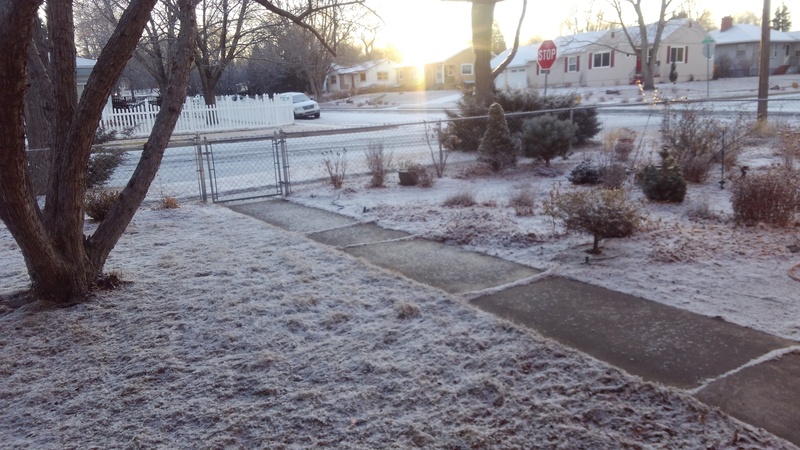 It’s hard to believe that six short weeks ago, work was called on account of snow. 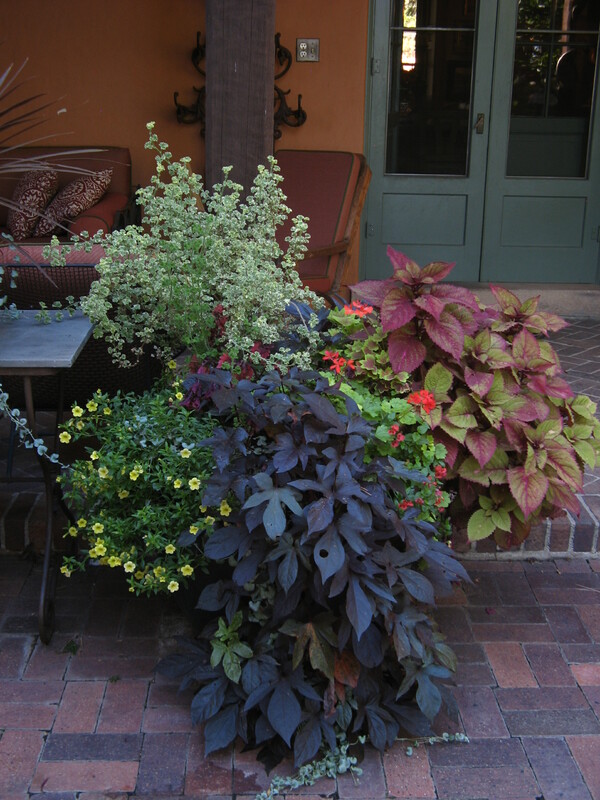 Although we have nearly finished planting annuals for the season, the carport and back patio are once again filling. 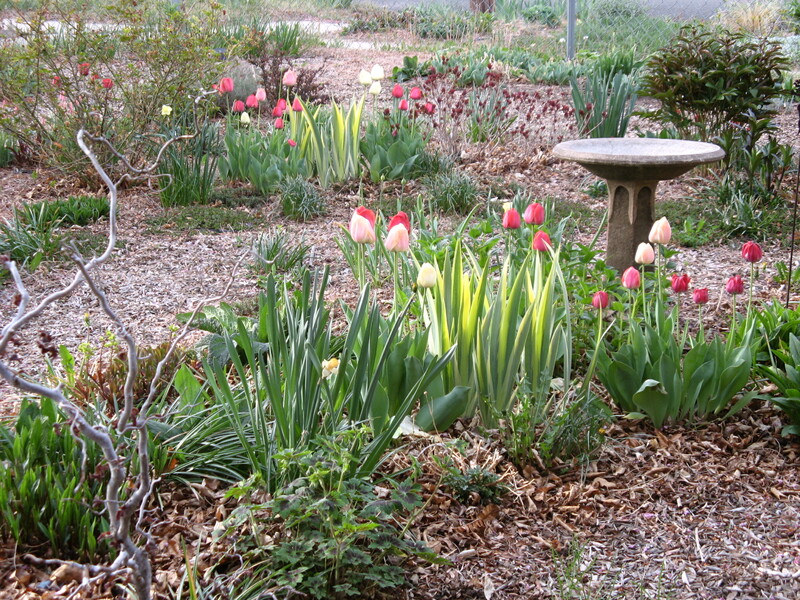 This time it’s with perennials. 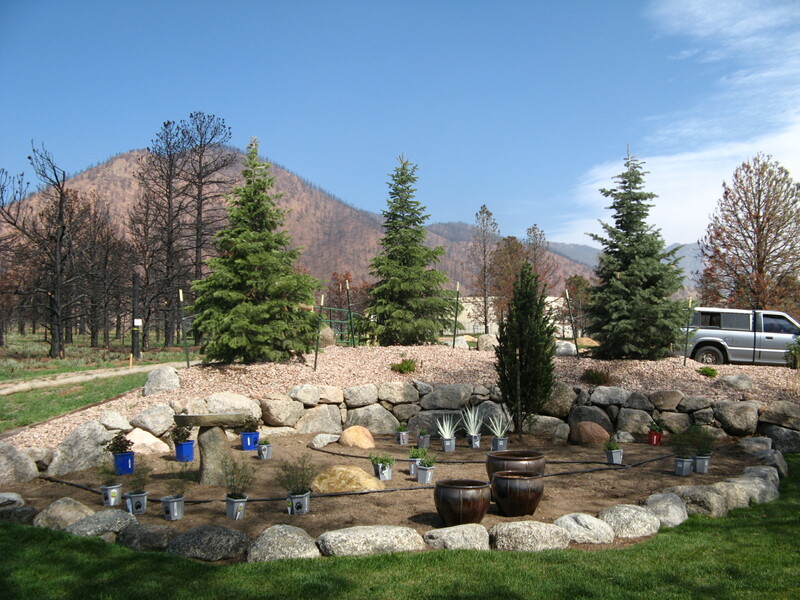 We have projects ranging from converting an artificial turf putting green destroyed in the Waldo Canyon Fire to establishing groundcovers under a lofty canopy to planting up beds created in response to water shortages in an effort to reduce thirsty turf. The old putting green about to receive its first plants. Planting season will continue through June, as long as daytime temperatures stay reasonably normal (no triple digits, please), and evenings cool. The one condition: Homeowners must take responsibility for regular hand watering to get plants established. To be within the rules of current water restrictions, any watering that takes place outside of your designated hours and days must be done with a drip system or by hose with a positive shut-off and on trees, shrubs, and beds only. If too much heat comes into the forecast, we’ll take a break in planting. It really isn’t wise to ask plants to deal with getting situated in a new location during a hot spell. Too much stress. Don’t believe me? Try it yourself: Move to a house without air conditioning in, say, Houston in July. Doesn’t sound the least bit appealing, does it?